Hugs for Hailey: A special gift. Last year was quite the year for new accomplishments for Hailey. 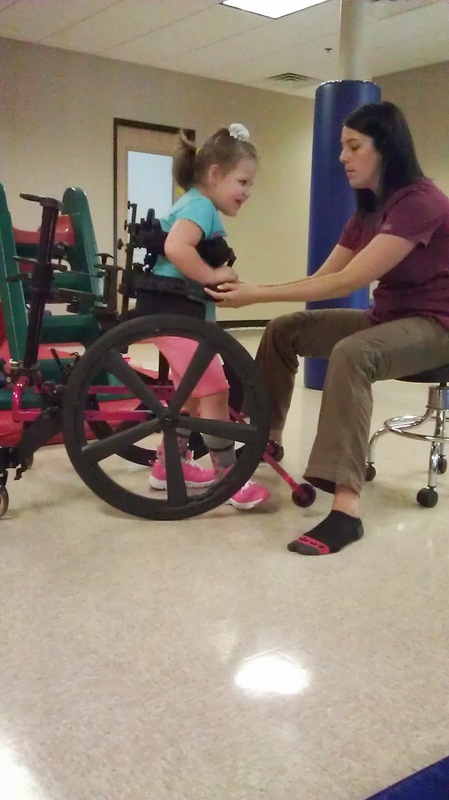 Being in an almost vegetative state, then sitting up on her own, to barring weight on her legs, to taking steps, to actually walking with assistance. Our limit through our insurance was reached and Hailey needed a walker. We had a walker from a previous episode of Hailey's where she needed help to walk. She didn't use it long, but I didn't get rid of it. Hailey quickly grew out of that walker and needed a new one. Thankfully a little girl who attends the same Therapy center as Hailey does, was getting a new one and no longer needed her current one. She graciously let Hailey use her reverse walker. Hailey quickly reached the limit on the height for this reverse walker and now we were looking for a new one. One that would grow with Hailey. Insurance was a no go. Being the beginning of the year we have to reach our deductible for the insurance to pay for it, or we buy it ourselves. Even buying it through a company referred by the therapy center, this walker would cost a LOT of money! I did some research seeing if it would be more cost efficient to purchase this walker directly from the manufacture. I checked all the different "adaptive" websites that sold these walkers and the best deal was eventually found!! In December, Josh was at work and received a gift with Hailey's name on it. This gift was given to us right at the most perfect time! Hailey NOW has a new walker that will grow with her for at least another 2 feet!!! The only downside according to Hailey, "It's NOT pink!!" On behalf of Hailey, Josh, and myself, we like to thank the following people: Brenda, Casey, Peyton, Mark, Donnell, Marilyn, Mark and Lisa!! You have given us an incredible gift and to say thank you would not be enough! Hugs to you all!! !